As expected radar displays are lighting up this morning. However, even though the radars may be showing snow, that doesn't mean the snow is reaching the ground. The air is still relatively dry at the surface. Dew points ahead of where the snow is reaching the ground is in the single digits. Where snow is falling, dew points have climbed in to the 20's. We'll need to see the dew points increase to those levels (20's) before the snow makes it to the ground. Not too much has changed with overnight computer model runs. Although one thing did peek my interest this morning... The European forecast agency's computer model has come in a little wetter compared to all of the other models. It is also cooler at the surface which could mean more snow for areas in southeast Missouri, southern Illinois and western Kentucky. Specifically, the European model is hinting at a 1" to 2.5" snow for those areas. I'm going to keep the forecast I put out last night but I am going to raise the snowfall amounts just a little bit for southeast Missouri, southern Illinois and western Kentucky. Generally speaking around the St. Louis metro I am expecting 2" to 3" of snow to fall. There will likely be a few spits of snow through late morning but I don't expect the accumulating snow to begin until mid-afternoon and it should end by 2am Tuesday. Snow showers will be possible Tuesday morning (rush hour +) but shouldn't add to the totals. The forecast will be a little trickier for this area as there will likely be a mix of snow, sleet and freezing rain north to south across the area. Places like Cape Girardeau, Perryville, Sikeston, Poplar Bluff, Carbondale, Marion (IL) and Harrisburg there could be 0.5" of snow to 1.5". Towards the end of the event, the snow is likely to change over to sleet or a little freezing rain. Places like New Madrid, Paducah, Mayfield, Murray and south will mainly see light sleet/freezing rain. There could be a little snow mixed in for Paducah but it should be no more than 1"
I think we are looking at anywhere from 1" to as much as 3" of snow. I think the 3" amounts will be northwest of Indianapolis. 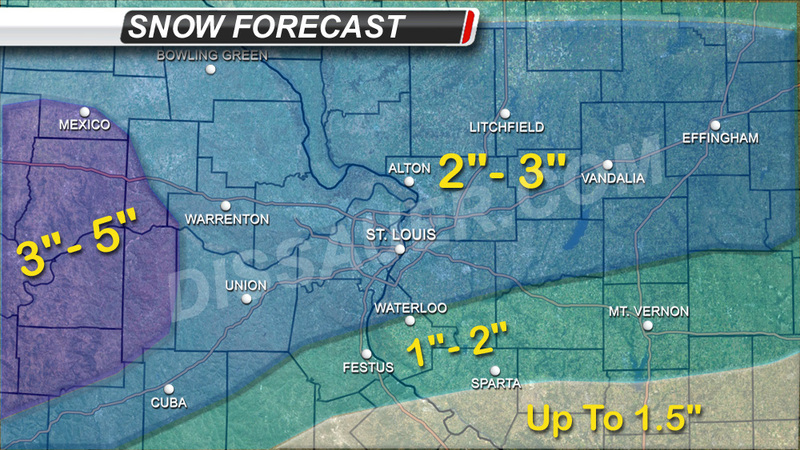 Here is a look at what the other overnight forecast models are suggesting for the Midwest. First we start with the NAM. Now let's look at the GFS. I have also mentioned the possibility of a little freezing rain for northeast Arkansas and parts of southeast Missouri and western Kentucky. Here is what the GFS is showing for freezing rain accumulation. Again, any freezing rain will be light so don't get too concerned, although even the smallest amount can make roads slick. Thanks for staying on top of the weather for us! Although I seldom take the time to leave a comment, your blog and your Facebook page and/or Twitter feed is my family's place to go for staying on top of any significant weather events. We appreciate the time and effort you put into your weather tracking and forecasts.